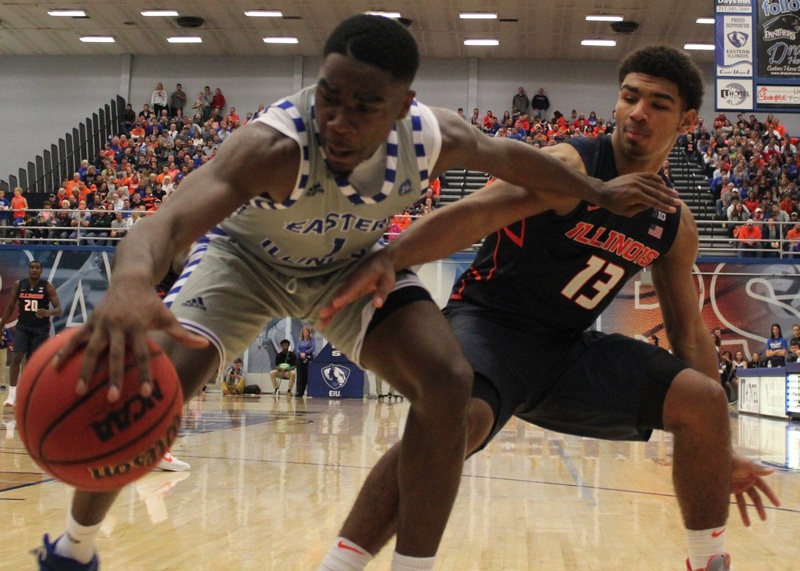 You probably know most of the relevant details of the 80-67 EIU triumph at Charleston last Friday. Jay Spoonhour and Brad Underwood agreed to hold an informal scrimmage, and use it as a practice. Then, they each abandoned that plan and found themselves in a competitive brawl. Now, here are the irrelevant details. Before the game, Josh Whitman and Tommy Michael stood courtside, talking about various things. These two were the top contenders for the job Whitman eventually got. Michael was an associate athletic director before taking the top job at Eastern. He was an academic advisor in the DIA before that. It was good to see that no hard feelings came between the two re: that job search. 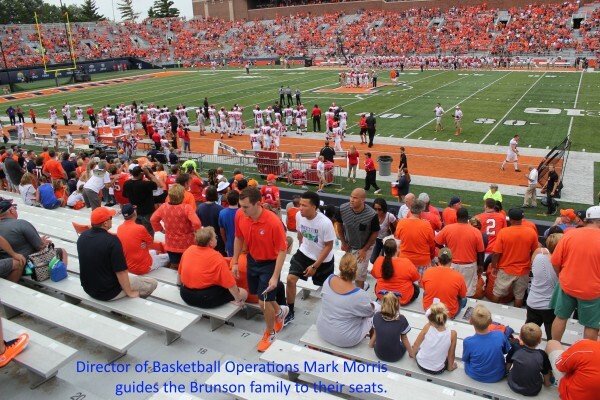 Michael was in a good position to know exactly what happened with Matt Bollant at Illinois. He chose to hire Bollant to lead EIU women’s basketball. Keep that in mind when remembering Bollant’s tenure, if you think about women’s basketball at all. An unexpected member of the audience was Machanda Hill, Malcolm’s mom. 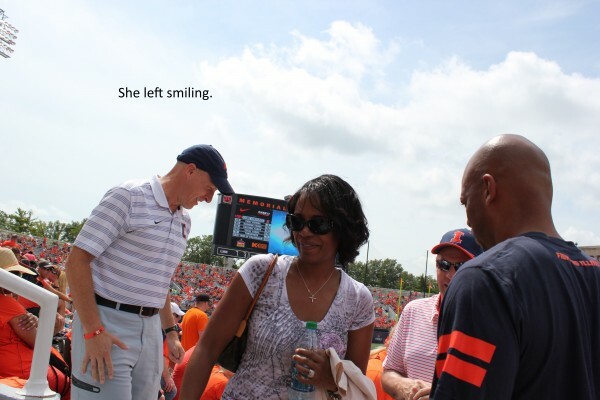 It turns out that she hasn’t seen enough Illini basketball, yet. 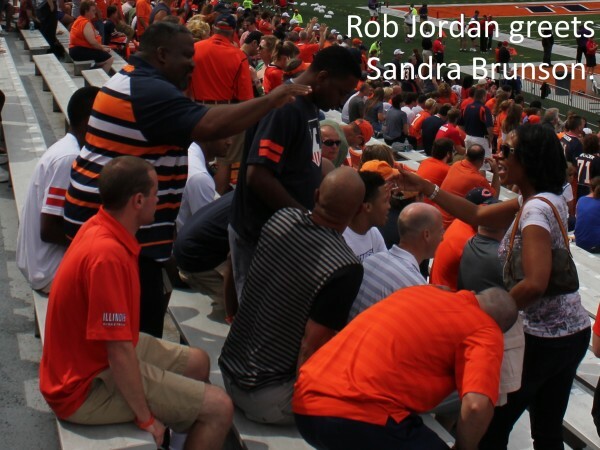 She sat in the corner of the upper deck along with Kipper’s mom Tanicia Porter and Aaron’s dad Rob Jordan. Rob didn’t enjoy the scrimmage as much as, say, Eastern Illinois fans. Also sitting in an upper corner were Bob and Cheryl Easter, who had great seats when he was university president. Cheryl continues to be a huge basketball fan. She didn’t mind sitting in the corner. Truth is, Lantz Arena doesn’t really have bad seats. 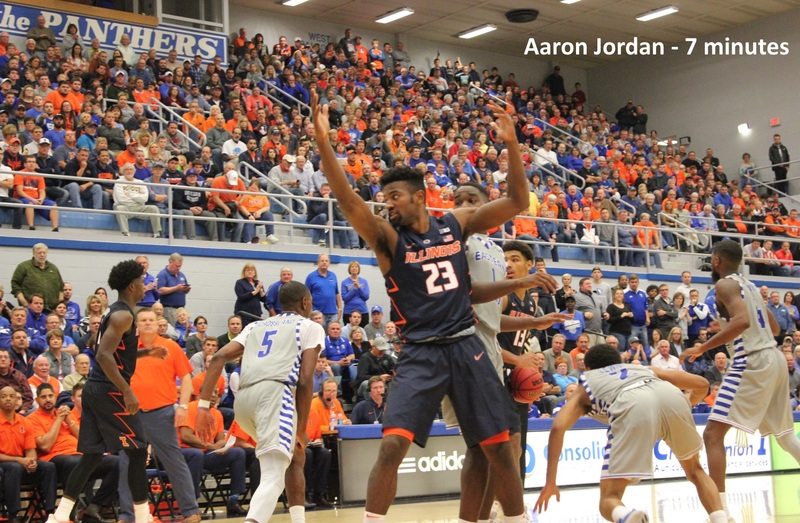 Both Leron Black and Kipper Nichols said it felt like a high school gym. 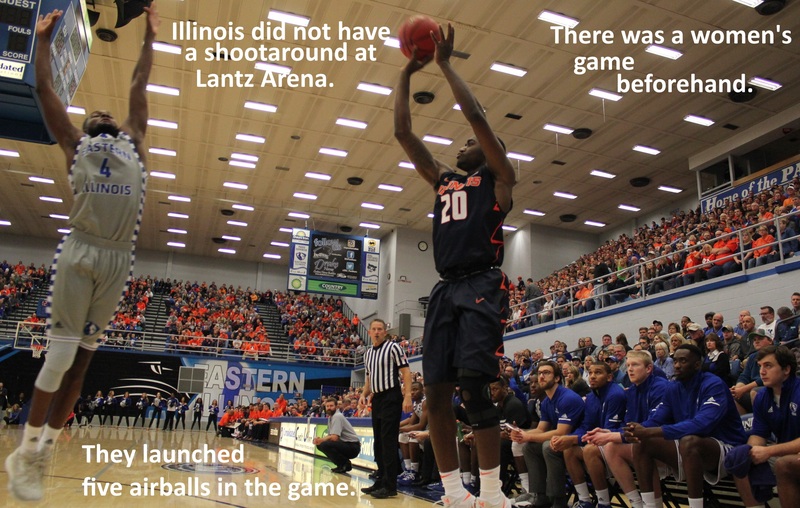 That setting, and the backdrop it brings, might be the cause Illinois’ shooting woes. Because EIU also hosted a women’s scrimmage, also for charity, there was no opportunity for an Illini shootaround in Charleston. 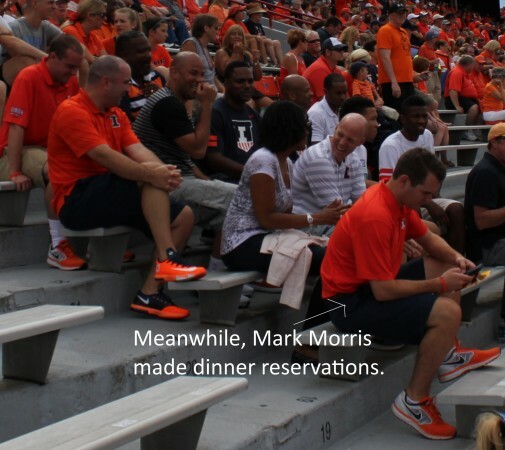 Instead, the pre-game meal and shootaround took place in Champaign. The Illini then hopped on a bus for Charleston. They never got a chance to acclimate to Lantz sightlines. Perhaps the meal wasn’t enough, either. Mark Smith resorted to eating D’Angelo Jackson alive, both literally & figuratively. Everyone reported that Lou Henson attended the game with lifelong friend Loren Tate (and Champaign golfer Joe Thompson). But perhaps no one noticed the touching scene of Josh Whitman assisting Henson out of the building, late in the game (before the rush). With Whitman’s help. Lou beat the rush (and the court storming). Tyler Underwood didn’t sit with the team. He sat behind the team. He didn’t travel with the team. 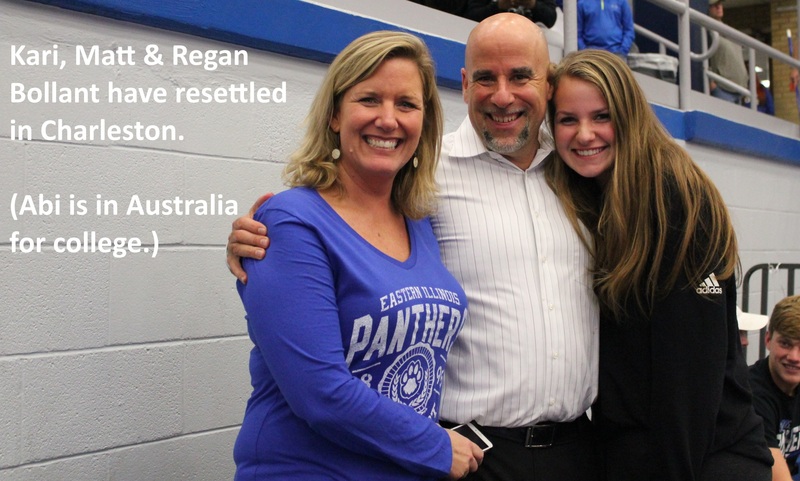 He traveled with the head coach’s family. That’s because NCAA rules forbid transfers from traveling during their sit-out year, the same reason Rayvonte Rice watched that Gonzaga game in Champaign. Greg Eboigbodin, Matic Vesel, Da’Monte Williams, Adam Fletcher, Aaron Jordan, Brad Underwood, Kipper Nichols, Patrick Shulte, Jamall Walker, Orlando Antigua, Chin Coleman plus Susan Underwood, Tyler Underwood, Josh Whitman, Lou Henson and Loren Tate. Tyler is appealing to the NCAA so he can play this year. If that doesn’t work out, he’ll probably travel to away games with his family, not his team. 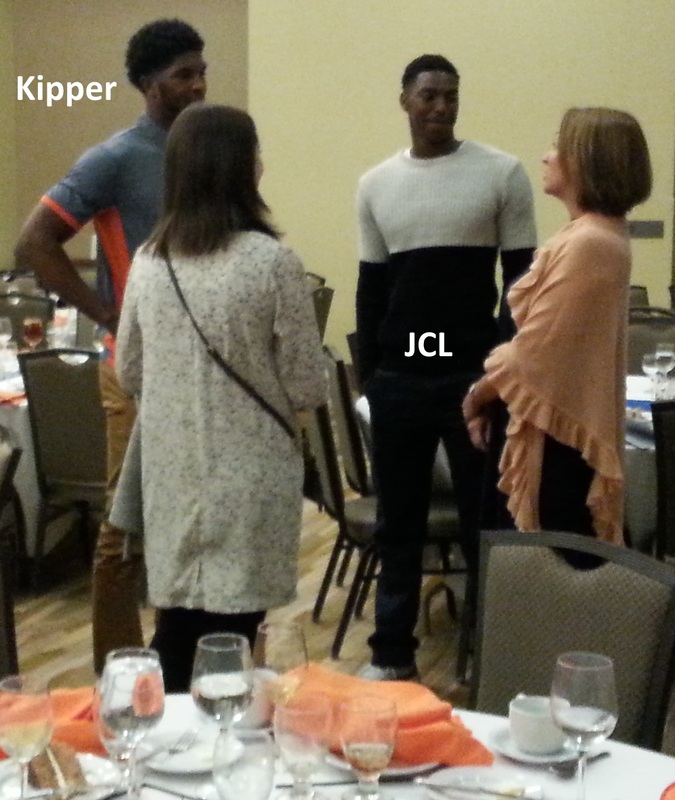 Before the Illini Basketball Banquet began Monday night at the i-Hotel, Rob Jordan said players’ families were wondering who’d show up. 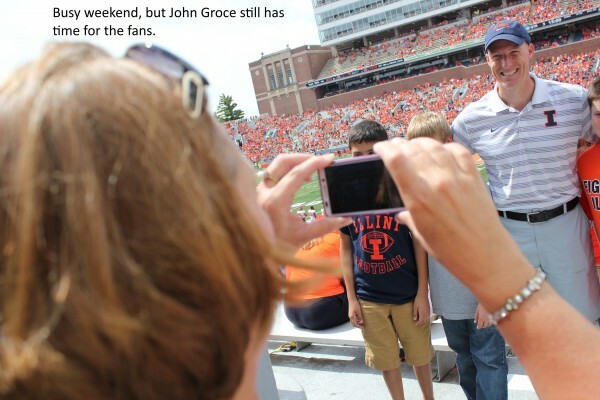 Would John Groce return as Bruce Weber had in 2012? No. 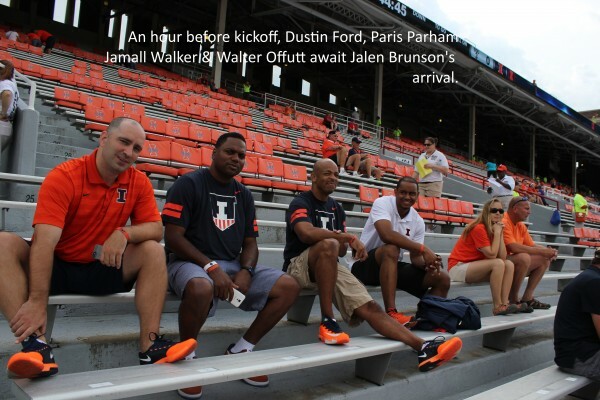 Paris Parham also didn’t attend, despite his continuing residence in Champaign. Dustin Ford and Darren Hertz weren’t there, but they have new jobs in Ohio. Brad Underwood, who lives in the i-Hotel, was there. And he stayed as long as anyone. One idiot was in attendance, and because he forgot to check whether he’d packed the batteries for his expensive camera, the following pictures will be blurry. Paul Schmidt and Adam Fletcher were the only remaining staff sitting at the coaches table. Underwood, Josh Whitman and Chancellor Robert Jones joined them. You wouldn’t call it the head table necessarily. It was off to the side. Really, everything about the event was low key. Unlike years past, the players never spoke. Josh Whitman spoke twice. The first time around, he profusely praised the previous staff. “I can’t say enough good things about our outgoing coaching staff.” (listen to full speech here). He told of dark, difficult days throughout the 2016-17 season, and especially public opinion of the program. He promised better times ahead. The public perception of Whitman seems largely if not hugely favorable, and his comportment Monday night did nothing to change that perception. 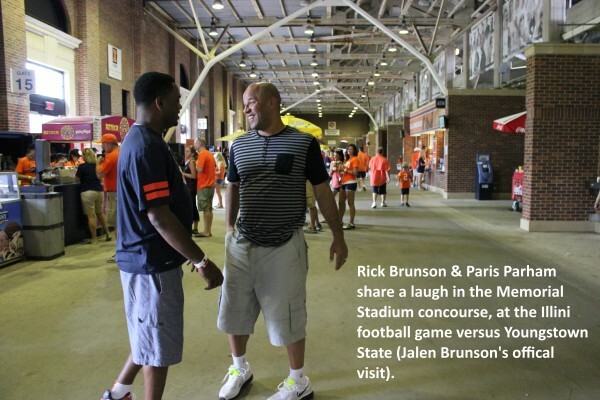 Jamall Walker and Brian Barnhart emceed. Barnhart and a series of sponsors from the community announced individual awards (link to video) and Walker thanked all the people behind the program who’s names you rarely hear (link to video), then handed out goodies to the players (link to video) which were fitted letterman jackets for the freshmen, and blankets for the upperclassmen. Jalen Coleman-Lands regarded the blanket as high-level swag. Kipper Nichols, who said his body fat is 5%, acknowledged that someone measured his sculptured physique rather than guessing his jacket size. 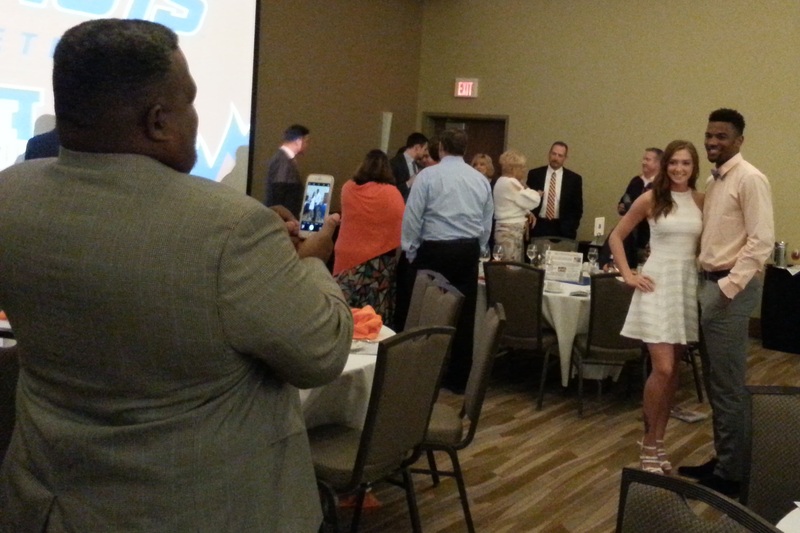 Two players who were distinctly present, and seated at what you might call the head table, were Aaron Jordan and D.J. Williams. 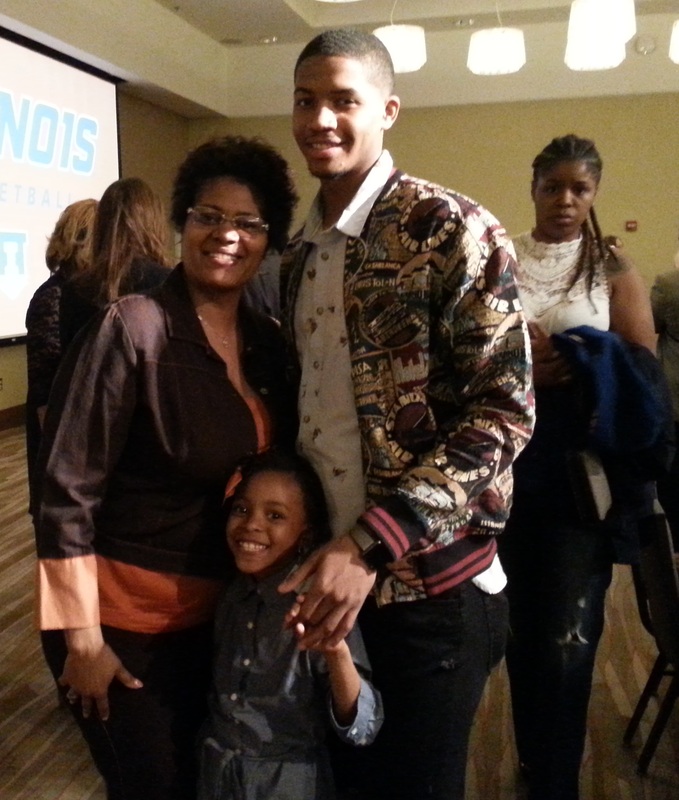 Te’Jon Lucas and his mother Marie were also at that table. The Lucas parent are divorced, and Thomas Lucas sat at a table on the other side of the room. He lives in Milwaukee. She lives in Texas. Both parents are engaging people, and it’s not hard to see what brought them together. And it’s not hard to see why it fell apart. Marie is brimming with personality and opinions, you might even say attitude, but in a good way. She’s the type of mother often found behind a D-1 athlete. Laura Finke and Machanda Hill are likewise women to be reckoned with, but again, in a good way. Strong women. Thomas Lucas is mellow and approachable. In conversation with Underwood, he gracefully accepted frothing praise from this reporter, with agreement from the coach, that his three-piece houndstooth suit and tie elevated him into competition for best-dressed attendee. He’s almost sixty, but after changing his diet and losing 25 lbs. over the last year, he’s now back to playing competitive basketball. He’s eating less meat, and more ginger and garlic. It gives us hope, especially the idiot, who gained 25 lbs. in the last year after his aging knees forced him to stop running six miles every other day, and is basically falling apart physically. 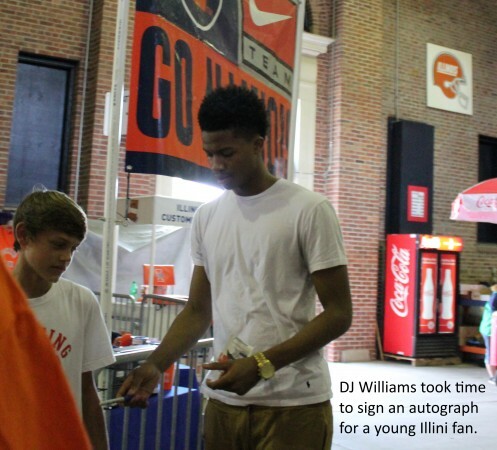 Malcolm Hill doesn’t really need any more accolades at this point. He just needs what Rayvonte Rice should have had two years ago. He needs the NBA to recognize that, whatever his physical limitations, he finds a way to get the ball in the hole. 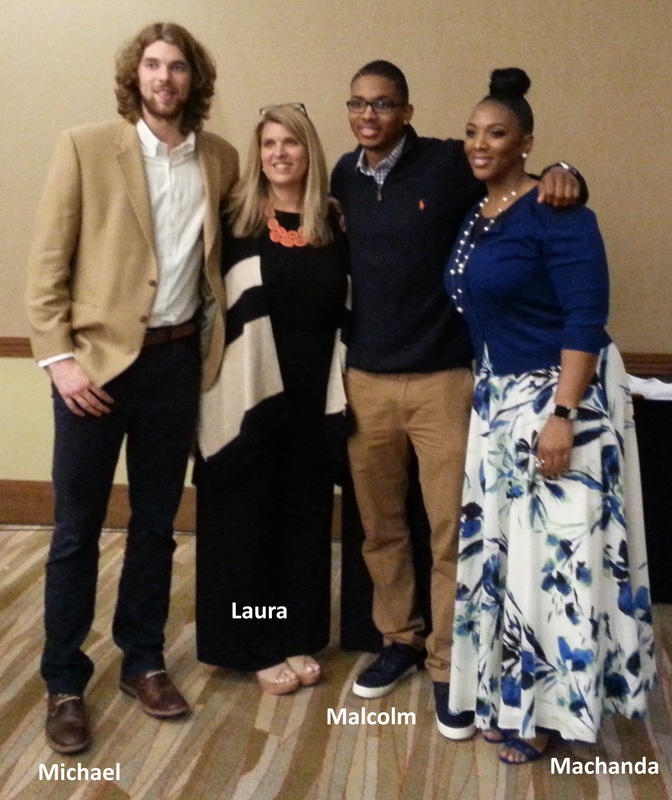 Malcolm’s AAU coaches Patrick Smith and Doug Sitton attended his final banquet. And Patrick observed that Malcolm is not the next Michael Jordan. But maybe he’s the next Larry Bird. He has crafty old-man moves. 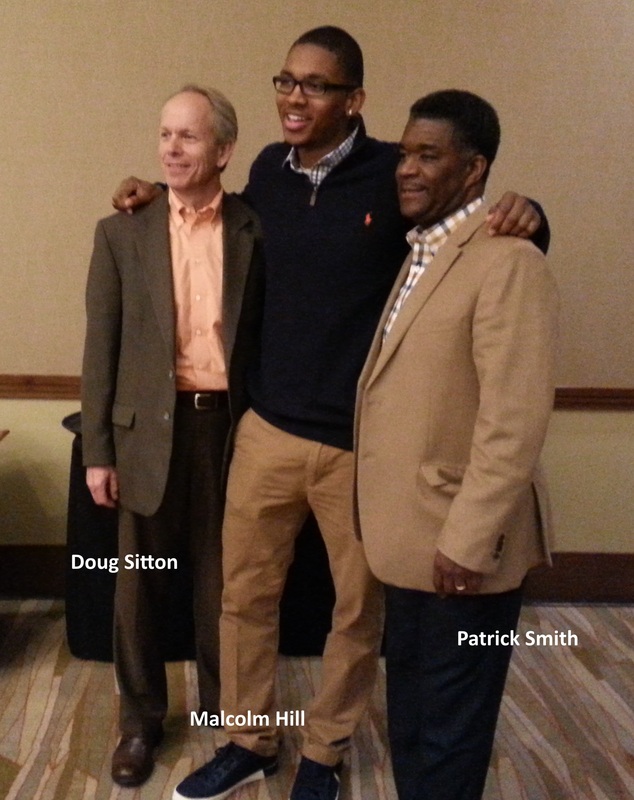 Smith and Sitton have been part of Malcolm’s life since third grade. “Seriously, you could tell when he was …” I queried. That seems odd, but it doesn’t conflict with anything we’ve known about Malcolm all these years. You’ll recall that even during his freshman year, his teammates universally recognized him as the gym rat of the team (video link). 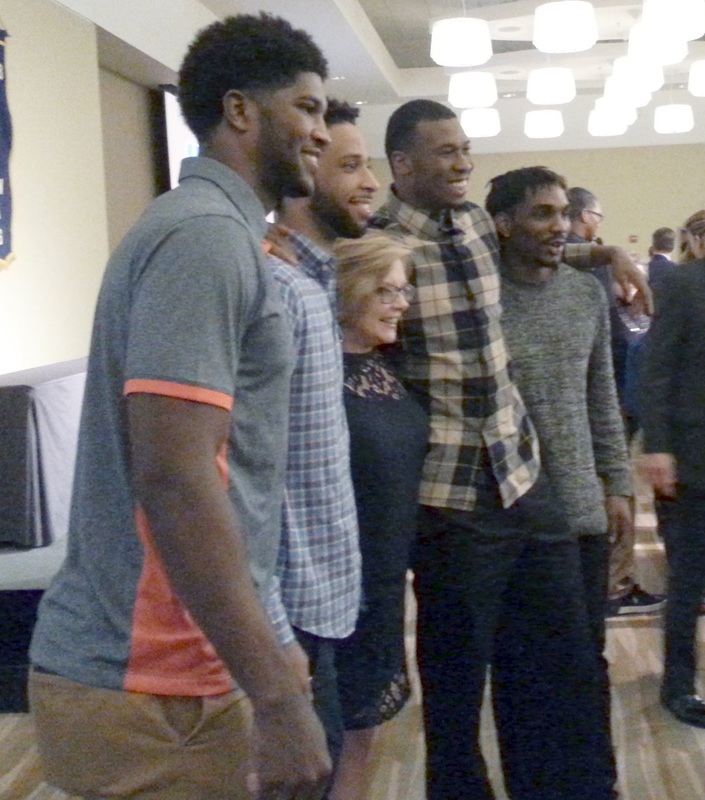 The second-best part of the evening was a tag team by Underwood and Whitman, in which they simultaneously praised & roasted Tracy Abrams and Malcolm Hill. The best part of the evening was watching Malcolm greet a very young man with forceful enthusiasm, complimenting him on a particular sartorial choice. 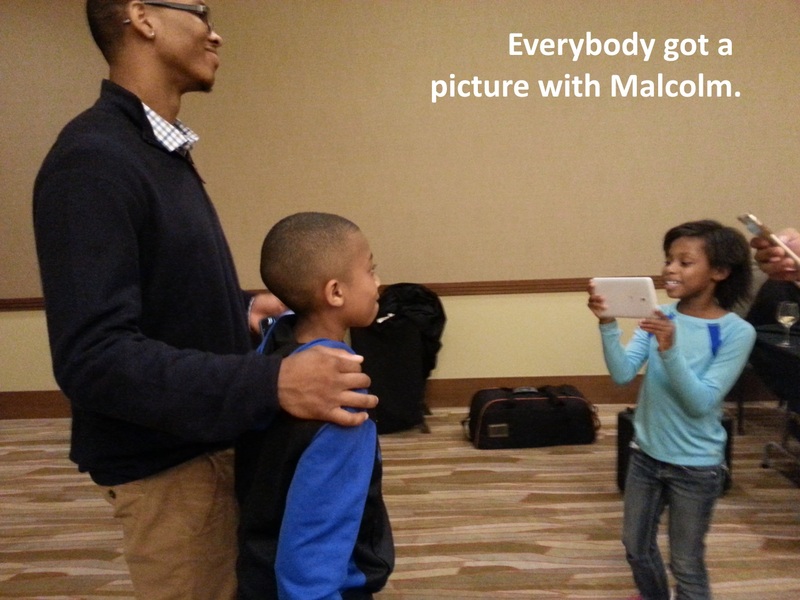 Malcolm gets that he’s a star, and on these last two Illini teams, the star. But he’s also motivated by human kindness. He gained no advantage by showering attention on a pre-teen with a sharp outfit, but he expressly acknowledged the kid not just for looking good, but for having earned the outfit himself (paper route?). 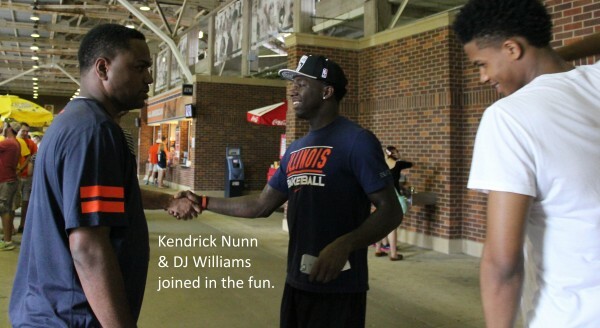 Jamall Walker emphasized that Malcolm never thought Illini basketball was about him. One current roster member expressed shock about John Groce’s closed-door media policy. On Day One, Groce said practice would be closed to the media because he wanted to maintain a teaching atmosphere. 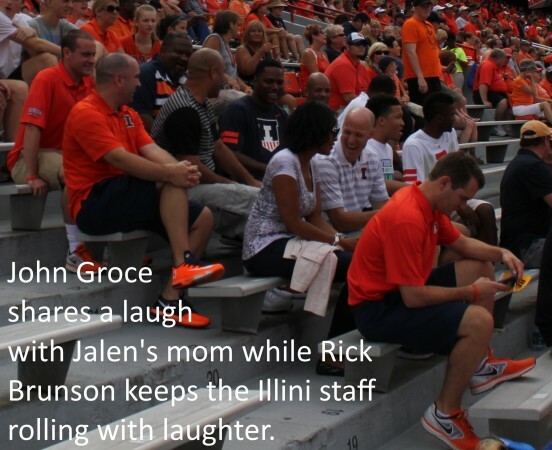 But as the players know, the Groce practice was a revolving door of Willie Hortonesque proportions. Basically, the only people who weren’t watching were reporters. Underwood is unfazed by the media. He doesn’t use the amplified headset Groce relied on. He doesn’t even use a whistle. That’s probably the reason his teams execute so well. They understand what he’s saying, and aren’t subconsciously trying to block-out the onslaught of sounds. It’s just another example of silly NCAA rules creating anxiety. Look here for more of that in the next couple of weeks. 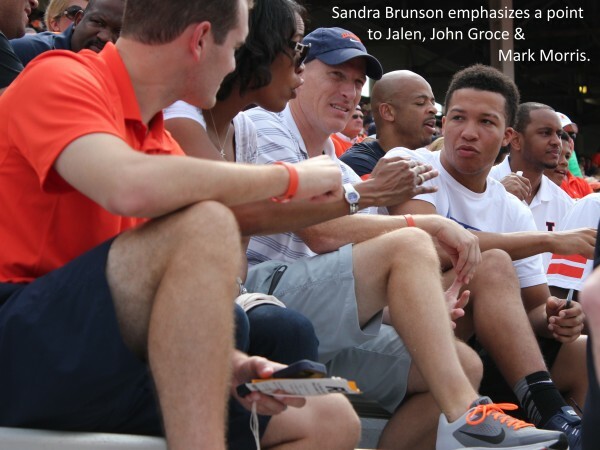 In the long run, the biggest news from Labor Day Weekend 2014 will have little to do with Jalen Brunson: Allison Groce is expecting her third child. The due date is March 18, “right between the Big Ten Tournament and the NCAA’s” she notes. And if Abraham* Groce does not choose to vacate the womb early, March 18 will be his birthday: With John Groce on the road for half the year, even live birth must be scheduled months in advance. Thus, as with the succesful debuts of Conner and Camden, Groce child #3’s delivery will be induced. 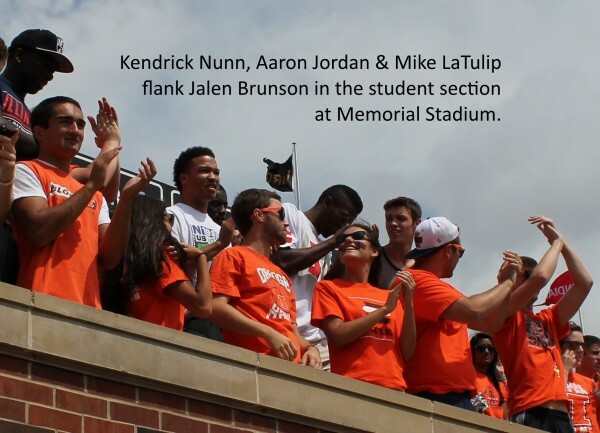 If it weren’t for those famously silly NCAA rules about publicizing recruiting activities; the Illini coaching staff would be delighted to share its vision of Jalen Brunson’s future. But they can’t. The Brunsons themselves were off-limits to the media during Jalen’s Official Visit, per those same silly rules. Thank god for pictures. They say a thousand words. So here are twenty-thousand words. 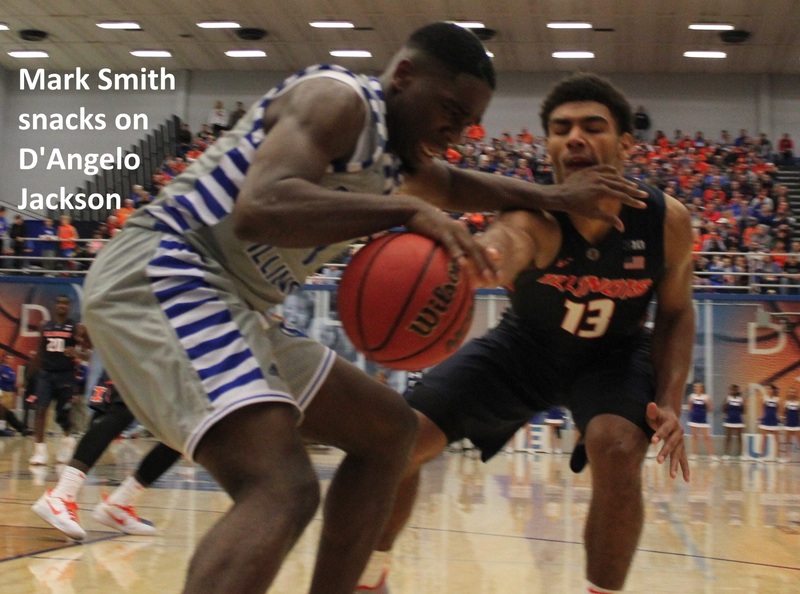 Mike LaTulip and Aaron Jordan ran point on Brunson, from the player’s perspective. Paris Parham took the lead on Rick Brunson. 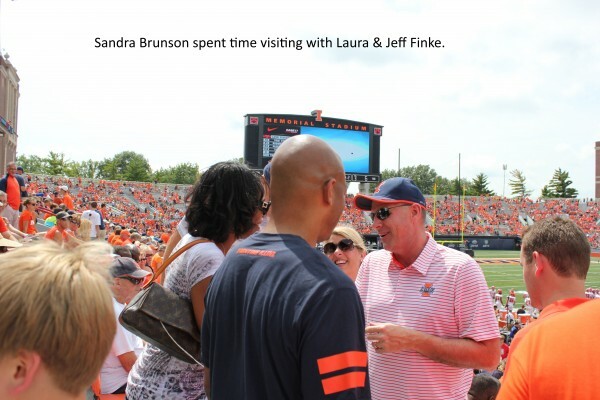 Old friend Rob Jordan and new friends Laura & Jeff Finke made Sandra Brunson feel like family. LaTulip is perfect in this role. 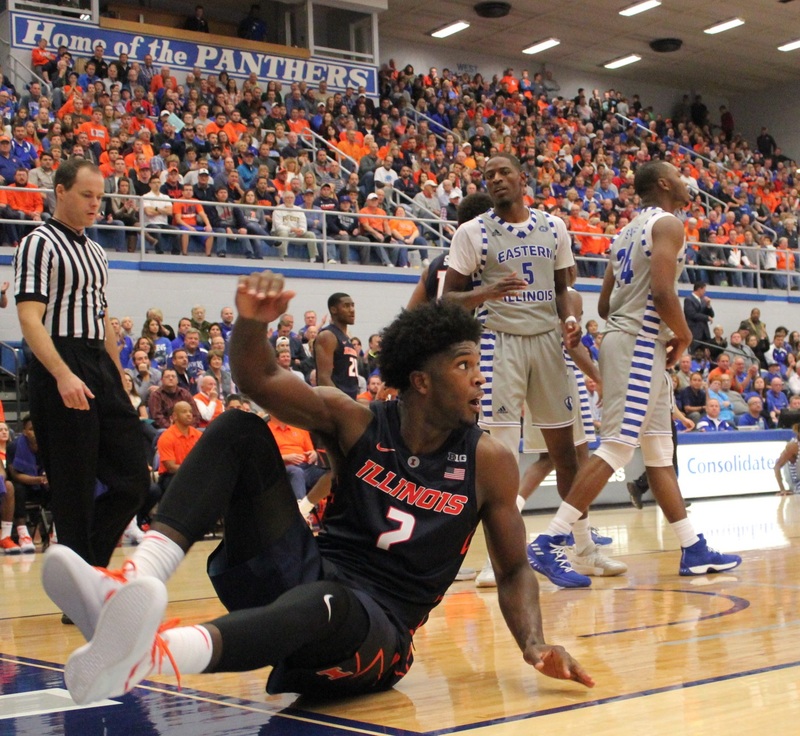 He can articulate the offensive and defensive principles of John Groce’s system, perhaps better than anyone else in the program, and from a Point Guard’s perspective. Mike is a team favorite, considered by his teammates to be the funniest guy among them. Mike Basgier did not attend the football game, and Ryan Pedon was Best Manning a wedding. 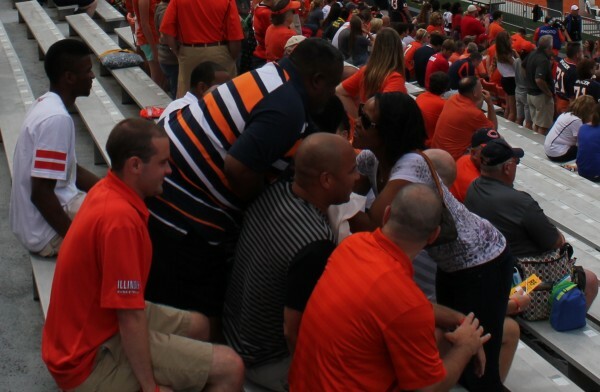 But the rest of the coaching staff was on hand, plus the Groce and Parham families. Parham is streetwise. Despite a devilish sense of humor, he’s capable of communicating the lay of the land to an old-pro like Rick Brunson, whose BS-detector is well-honed from his own college and professional basketball career. 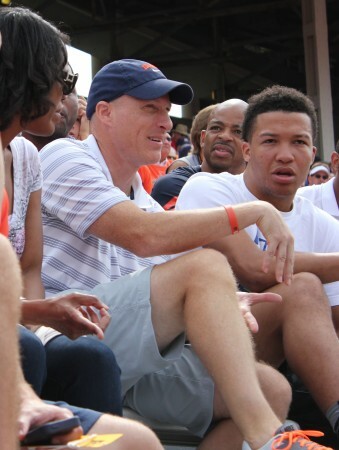 John Groce is ultimately the most important figure in this recruitment. But Rob Jordan is the wild card. Aaron’s dad is sincere and lighthearted. But he’s nobody’s fool. His relationship with the Brunsons goes back years. His understanding of the process, and his faith in the direction of the program, may be the most important intangibles in determining the final verdict.